There’s certainly no “Great Stagnation” for this part of the US economy! Carpe Fermentum! This month marked National Beer Day, which is celebrated in the US every year on April 7 marking the day in 1933 that the Cullen–Harrison Act was enacted to legalize the sale of beer in the US for the first time since 1920 (although it was limited to an alcohol content of only 3.2 percent) according to the Wikipedia entry for National Beer Day. Later that year, the Eighteenth Amendment of 1920 that outlawed alcoholic beverages was repealed on December 5, 1933, to officially end America’s first failed attempt at waging a War on Drugs (also known as Prohibition) that lasted from 1920 to 1933. 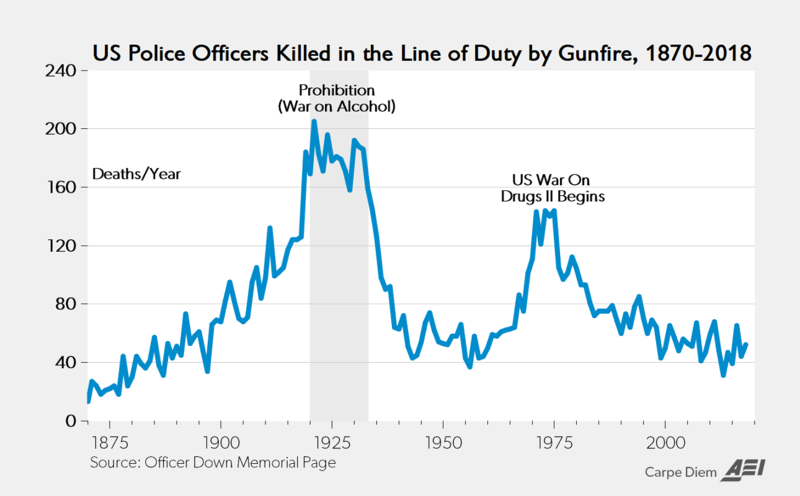 Legalizing alcohol in 1933 also ended the deadliest and most violent period in US history for America’s law enforcement officers when more than 2,500 police officers were killed by gunfire at an average rate of 180 per year, or one every other day during that 14-year period (see chart below). National Beer Day is a great time to recognize the Amazing American Beer Renaissance! The chart above shows the annual brewery count in the US from 1873 to 2018, based on data from the Brewer’s Association here. The growth in America’s breweries over the last decade, especially the exponential growth in craft breweries, microbreweries, and brewpubs, has to be one of the most remarkable small business success stories in a generation or more. Except maybe for the American energy renaissance and the recent exponential growth in shale oil production in Texas and North Dakota, I don’t think there are very many other examples of a rise in output or the number of US producers that can compare to the beer renaissance and the surge in American beer makers over the last decade. The number of US breweries last year reached a new record high of 7,450, the greatest number of American beer makers going back to 1873 when the Brewers Association’s records start and there were 4,131 domestic breweries (see chart above). Amazingly, the record brewery count in 2018 is a near doubling of US breweries in just the last four years since 2014 when there were fewer than 4,000 breweries, and almost four times the brewery count seven years ago of 2,047 in 2011. 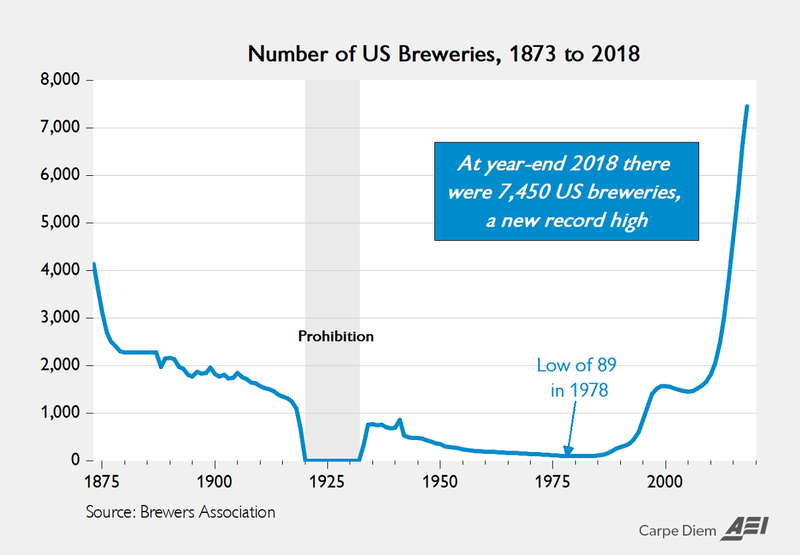 Except during the “War on Beer” period from 1920-1932 (aka Prohibition), the number of US breweries reached a historic low of only 89 mostly “macro breweries” in 1978, before rebounding to nearly 7,450 mostly craft beer makers last year. There was an increase in the brewery count of 854 last year, or more than two new breweries every day! Remarkably, US breweries have increased at a rate of more than two per day during each of the last five years starting in 2014. From the Brewers Association, here’s a list of US microbreweries by state (breweries that produce fewer than 15,000 barrels of beer per year with 75 percent or more of its beer sold off-site) and here’s a list of US brewpubs by state (a restaurant-brewery that brews beer primarily for sale in the restaurant and bar), and here’s a list of regional breweries by state (breweries with annual beer production of between 15,000 and 6,000,000 barrels). If you’re considering taking a craft beer vacation (“beercation”) this year in the US, Mexico, or Europe, here are some recommendations from American craft brewers. Find out about the many health benefits of beer here, here, here, and here including its anti-cancer properties, a reduced risk of cardiovascular diseases, and an increased bone density! 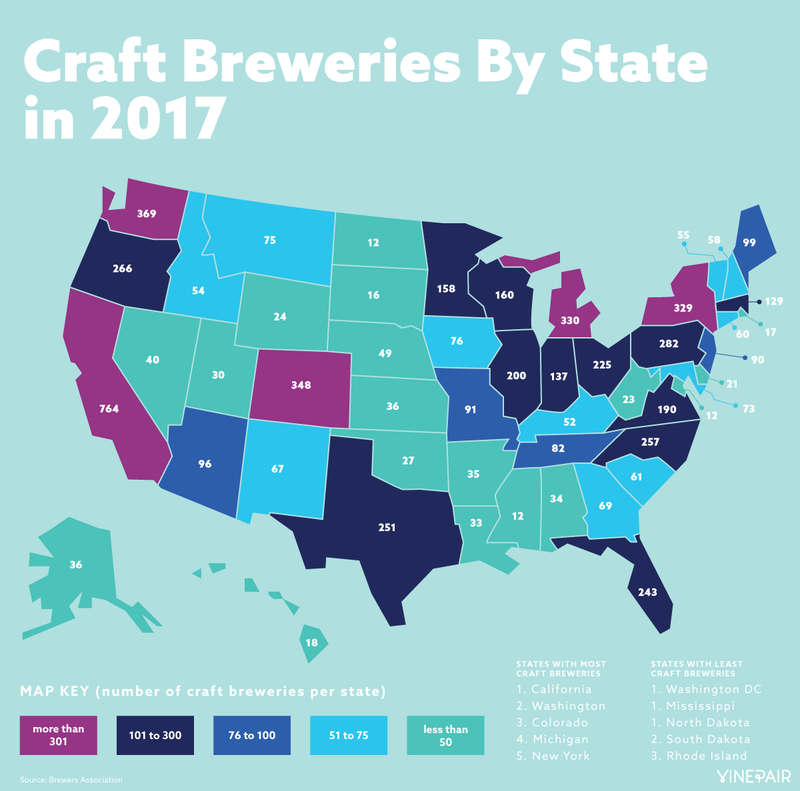 The map above shows the craft breweries by US state in 2017 from this website, which also shows a separate map for craft breweries per capita by US state in 2017. The Brewers Association recently released its second annual list of the 50 fastest growing small and independent craft brewing companies of 2018. “Even as market competition continues to increase, these small and independent breweries and brewpubs demonstrate there are still growth opportunities across a diverse set of regions and business models,” said Bart Watson, chief economist, Brewers Association. Thanks to the thousands of American “fermentrapreneurs” who have revitalized America’s now-booming craft beer industry, we have gone from a long period of limited choice among extremely low-quality, domestic macro-beer “swill” options to unlimited choices today for extremely high-quality domestic craft beer, which has become the envy of the world. Especially for those who love IPA-style beers, I don’t think you’ll find a better beer of that variety anywhere in the world, compared to what you can get today in America at almost any liquor store. To modify Gregory Zuckerman’s description of the US shale revolution for America’s Amazing Hops Revolution: For all of the criticism the US has fielded for losing its edge in innovation, surging American craft beer production is a reminder of the deep pools of ingenuity, risk-taking, Yankee ingenuity, and “fermentrapreneurship” that remain in this country—the new United States of Beer. There’s certainly no “Great Stagnation” for this part of the US economy! There’s never been a better time to be a beer drinker in America than today, given the awesome selection of craft beers from more than 7,400 domestic breweries in every part of the country, with two or more added every day! Welcome to America’s Amazing Hops Revolution and the Golden Age of Beer—there’s certainly no “Great Stagnation” for this part of the US economy!